One implication – with potentially big market consequences – of the strategy is that it sets the stage for the simmering U.S.-China relationship to boil over into a full-blown trade war in the weeks and months ahead. In September, the U.S. Trade Representative (USTR) began a “301” investigation into whether China’s intellectual property rules and practices are unfairly disadvantaging U.S. firms. The results of this investigation are expected to be released in a few weeks. Then, in November, the U.S. Commerce Department launched an investigation into aluminium imports from China – worth around US$600 million annually. What’s more, the Commerce Department started this investigation itself (that is, no U.S. company requested an investigation) – the first time it’s done this since 1991. So while the dollar figure is relatively small, the symbolism is big. I think these investigations are likely just the beginning… and it’s just a question of time before a trade war with China becomes a reality. As we’ve written about before, U.S. President Donald Trump has taken a “Fortress America” approach to global trade. Trump has led the U.S. into a sharp shift away from globalisation. One of his first acts as president was to pull the U.S. out of the Trans-Pacific Partnership (TPP) – a 12-country trade deal that would encompass around 40 percent of total global output. Trump has also been promising to get into a trade tussle with China since the presidential campaign in 2016. It’s widely assumed the 301 investigation will find China at fault in several areas. And the Trump administration is already drafting legislation that would tighten restrictions on Chinese acquisitions of U.S. technologies. 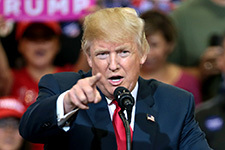 Political risk consulting company Eurasia Group says that other measures the Trump administration may soon roll out could include blocking Chinese cloud services companies from establishing data centres in the U.S.; a renewed emphasis on restricting sales of Chinese telecommunications equipment to major U.S. operators; and prohibiting Chinese acquisitions of U.S. firms in sectors such as artificial intelligence, automation, robotics, semiconductors and biotechnology. China probably won’t make major concessions to the U.S. And when China and the U.S. fail to reach an agreement, Trump will likely launch major tariffs against Chinese imports later this year. What’s behind this? Well, Trump is an economic nationalist… and it’s a campaign promise that’s relatively easy to make good on. The victims of globalisation are heavily represented in Trump’s core supporters. Trump may also be using trade restrictions to try to force China to do more to contain North Korea’s nuclear ambitions. You see, China is an important trade partner with North Korea. So it’s a crucial party to de-escalating tensions with North Korea. And the U.S. may be implicitly threatening sanctions if China doesn’t step up pressure on North Korea. With the U.S. retreating from globalisation, the door is open for China to take the reins instead. For example, China’s One Belt One Road (OBOR) initiative is a large-scale development and infrastructure programme announced by China in late 2013. Through OBOR, China intends to become an even bigger investor – with strings attached – throughout Asia and beyond. Spanning the breadth of Asia into Europe, the OBOR initiative incorporates around 60 countries, which account for a third of global GDP and around 60 percent of the global population. OBOR is a way that China can cement its strategic interests across a huge swathe of Africa, Central Asia and Eastern Europe at the same time. China says it will invest US$4 trillion into OBOR efforts. China is also seeking to make up for lost ground in technology by leading the charge on investment in new technology. Most of the world views China as a nation of copycats and counterfeits. But China accounts for 20 percent of all global research & development spending. That’s just second behind the U.S., with 26 percent. In the field of artificial intelligence, China is also second – just behind the U.S. in terms of the number of companies in the space and the corresponding amount of financing received by those firms. And when it comes to simply brute computing power, China remains the world leader. Since mid-2013, China has held claim to the world’s fastest supercomputer. These are just a few examples of the slow but inexorable shift of the global political and economic centre, from west to east. And the looming U.S. trade war with China will likely only accelerate this shift.